This morning I was in the Plestarstreet, where I discovered a nice shop with lots of books. 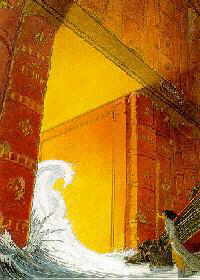 After sniffing around a lot I bought a book entitled The Walls of Samaris, a publication from the authors Schuiten and Peeters, for me, two totally unknown authors. 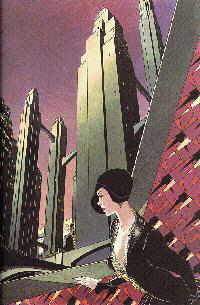 It has a subtitle called “The Obscure Cities”. A somewhat weird title, but interesting enough to draw my attention. The book deals with two - I presume obscure - cities, in which the city council of one city (Xhystos) decides to learn more about the other (Samaris). Therefore they appoint a young investigator, named Franz, who leaves for Samaris to thoroughly investigate the rumors about this city. What the rumors are, isn't told by anyone… at least for the moment. Franz has to travel far before he arrives in Samaris. At first sight everything seems to be in perfect order in this city until, after a few days, he notices that everything stays the same in Samaris. Every day he meets the same people, always doing or saying the same things. Later on he makes the shocking discovery that the city is a fake, one big Hollywood set. He tries to escape but of course he is too late. 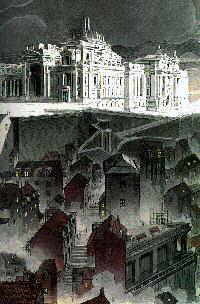 In a small shop in the Plestarstreet I have bought a copy of “The fever of Urbicande”, published by the authors Schuiten and Peeters. Since these names seemed familiar to me, I browsed through my archive and found a book of these authors: The walls of Samaris, I recall buying it in the same shop about two years ago. I believe I found it rather amusing back then. But I am not sure about it. Probably I have written a few lines about it in my diary. Unfortunately I am not in the mood to look it up. The fever of Urbicande is a more than amusing book. Sometimes it is even slightly frightening. Just as in The walls of Samaris it goes about one of the Obscure Cities, named Urbicande. This city, totally designed by the urbatect Eugen Robick, is stricken by a disaster originating from a gift that has been given to Robick. The gift is a tubeshaped cubicconstruction of passable small measurements. 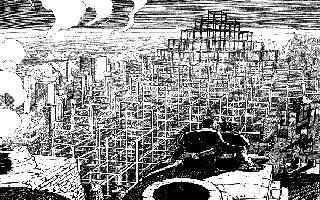 The cubic starts to grow, and it grows until it has covered the whole city of Urbicande with its enormous tube construction, which drills through everything. The cubic disregulates all life in the city and the people consider it a disaster. When the cubic mysteriously disappears like it came, the people starts to miss it and attempt to artificially reconstruct the cubic construction. I have heard that our Governments are worrying about the case of Urbicande. Although in official announcements the Governments state that the case is pure fantasy, it seems there is research into the possibility of the appearance of the same phenomena in our cities also. All this surprises me very much. Today I have inquired at the shop in the Plestarstreet whether a new publication of the authors Schuiten and Peeters has been released. Shopkeeper Hick could tell me that the authors are regularly questioned by the national security services about their connections with the Obscure Cities. He mentioned that it could take a while before a new publication would be released. Probably one has worried too much about the Obscure Cities. For months I haven't heard anything about it. Hick from the shop in the Plestarstreet just rang. 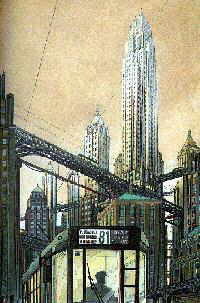 He told me that a new publication by Schuiten and Peeters about the Obscure Cities had arrived, titled: The Tower. Since I'm not able to get a copy today, I promised Hick to get one tomorrow. This afternoon I went to the shop to get a copy of The Tower. Back home I immediately unwrapped the book from its gift wrapping (Hick always packs my purchases in gift wrapping, even though he knows it's for myself). Well, after reading the book I was, most of all, confused. After reading The fever of Urbicande and the following messages of the Governments and especially other resources, I was frightened. Now I had a feeling like: 'what can I do with this'. The story goes as follows: maintainer Giovanni Battista is responsible for maintaining a part of an enormous tower. He leads a life where he never sees a human being and his letters to higher authorities are never answered. Once he is fed up with this situation he starts a quest for his superiors in the tower. The Governments have, as far as I know, not responded to the publication of The Tower. On the one hand I'm disappointed. After the reports following the publication of The fever of Urbicande, I thought that a new publication would cause even more rumors. On the other I'm glad this storm died down. No more fears for a fever of 'Urbicande' in our world. These stories seem to be made up. I got a panic-struck phone call from Hick, the shopkeeper from the Plestarstreet. 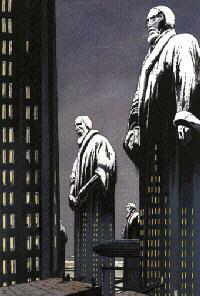 He told me that after interference by the Governments the printing of the new publication by Schuiten and Peeters called “The Archivist”, assigned to him, has been taken away. Nevertheless he told me that he had managed to withhold a copy for me. He kept it for me in present wrapping. When Hick gave me the book he entrusted me, in his own calm voice, with the fact that it was very illegal to possess this book. Notwithstanding the gift wrapping I felt myself emphatically watched by every civil servant. “The Archivist” is not an imaginary story, like the earlier publications by Schuiten and Peeters, but an account of research done by Isidore Louis, keeper of the records in service of the Central Institute of Archives, which is an institution unknown to me. The contents of the report by Isidore Louis did astonish me several times when I read it. The whole consists of scripts with twenty-one images whose maker(s) are unknown. Thus a number of cities on the Continent of Obscure Cities are described. The first description and three images deal with the city of Xhystos, a place I also came across in “The Walls of Samaris”. In “The Archivist” the city is decribed in such way that I didn't discover many new things, except that the political structure of Xhystos is not a democratic one. According to Isidore Louis the government of the city consists of a council with 21 unremovable members who are appointed by co-optation. The next description and the image belonging to it were more surprising. According to the description the image shows the sea off Cape Sodrovni. Where this Cape Sodrovni is situated I don't know but I will find out. 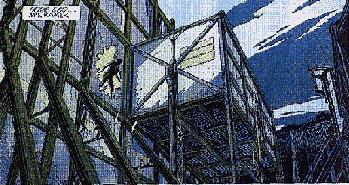 Odd is that the image also shows a part of the cubic construction which I already noticed in “The Fever of Urbicande”. I didn't get much from the description. Also for Isidore Louis the mystery of the cubic construction is inscrutable. It's late now. I will study the other documents tomorrow. Last night I dreamed the whole night about the mystery of the Obscure Cities. The whole thing puzzles me. The documents five through eighth from “The Archivist” surprised me so much that I fell off my chair. The sometimes oppressed sphere is so realistic that no living human being could have made this up. I think studying these documents will take many days. The documents deal with the city of Brüsel. According to the four images it is likely that Brüsel is a very big and important city on the continent. 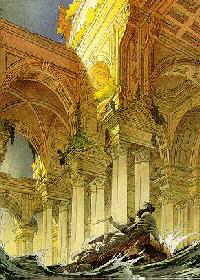 The city has two important distinguishing marks: the enormous skyscrapers and the impressive Palace of the three Powers. It appears that the city was rebuilt completely after the whole old city was totally demolished. Interesting is that some parts of the description of Isidore Louis are quotes from a work by urbatect Eugen Robick named “Valuable Travelling Notes” in which he describes the fascination of everyone who arrives in Brüsel. Studying the documents concerning Brüsel fortify my opinions that the Obscure Cities do or did exist. I am going to celebrate Christmas now. 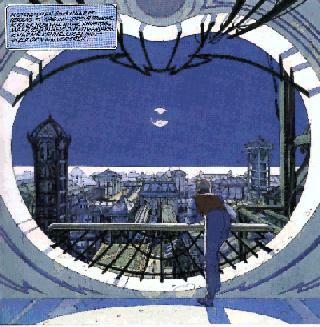 I have studied the remnants of “The Archivist” in which, among other things, the city of glass called Calvani, the industrial city Mylos and Alaxis are illustrated and described. However much these images impressed me, they couldn't surpass the shock that the descriptions and images from Brüsel gave me. The only thing that still struck me was the image of Calvani, where a family is portrayed. According to the description this was a portrait of Robert Louis Marie de la Barque and his family. He is a person I have heard of. The text doesn't give any information about this man. Let me conclude with some words by Isidore Louis: “Further I have to repeat that this universe is so complex that no human intellect, how big it may be, could think it of, yet realize it.” I suspect that “The Archivist” has been taken out of the stores to prevent panic by the people. I wonder how many people are aware of the existence of a parallel world next to ours. It has been over a year now since I got hold of “The Archivist”. Even though the writing made quite an impression on me, the fact that no new information about the Obscure Cities has been published by any means makes me sad. More and more I get the feeling that everything is a fabrication anyway. I booked a trip to Athens, to relax for a couple of weeks. Tomorrow I will buy some travel guides at a local shop specializing in travel information. I have to say that I was rather surprised and even disconcerted when I went to the travel information shop and found, while looking under A for Athens, a book titled “The road to Armilia”. The topographical name of Armilia was unknown to me, but another name which occurred in the book took my breath away. Slowly I felt the ground slip away from under my feet. When I was brought round by some of the employers, the first thing that I did was to muter that everything was fine with me. I paid the price mentioned on the label of the book and rushed home, where I telephoned my travel agent to cancel the trip. Unsteadily I opened the book at the same page where I opened it in the shop. It stood there exactly like I had read it in the shop, it was not a question of hallucination. On the top of page 28: “We've been flying over Brüsel for over an hour now”. In a hurry I started to read the book from beginning to end. The only possible conclusion was that “The road to Armillia” is a description of a journey by zeppelin along the north-western side of the Continent of the Obscure Cities. Although I gave up all hope of learning more about the Obscure Cities some time ago, I now own a detailed, richly illustrated description of several cities and a map with the routing of the journey. One could faint for less. The journey begins in Mylos, the industrial city which is written about also in The Archivist. From there the journey takes one to the immense city of Brüsel, via Porrentruy and Muhka, two unknown cities to me. Regarding the new descriptions I more and more am convinced that Brüsel is the most impressive and important city of the continent. However the information that “The road to Armilia” provides about this metropolis is, according to me, rather parsimonious and deepens my desire for a more detailed book about this city. Besides Porrentruy and Muhka we learn about two new cities: Genova and København. There is also a description of Calvani, the greenhouse city, that Isidore Louis, the record keeper, wrote about, and where Robert Louis Marie de la Barque (about whom I can't find anything) seems to live. The report ends with the arrival at Armilia, the arctic city I had never heard of before. I will thoroughly examine the book for the next few weeks, and also ask Hick, the shopkeeper from the Plestarstreet, if he knows anything about it. I don't think so, because he would certainly have told me. It has been over a year now since I heard some news about the Obscure Cities. I don't like this at all. The existing information about the Obscure Cities is, considering the number of years between “The walls of Samaris” and the latest publication “The road to Armilia”, somewhat lean. Does it have to take this long before something new reaches us from the continent of the Obscure Cities? The exact location is, despite a lot of research, still unknown to me. However - especially after reading “The road to Armilia” - it was clear to me that the Obscure Cities do exist, I've recently more and more begun to feel that it is a concoction after all. To me personally, it would be a disaster; so much time and energy wasted. I have closed the chapter about the Obscure Cities for good. I can't stand it anymore. I will fully concentrate on my daily duty. I can assure you that my heart stood still today. I will describe as well as possible what happened to me today. This afternoon I was walking along the bookshop in the Plestarstreet when I suddenly was pulled into the shop. Hick was the perpetrator. I informed if he was crimping customers. Hick, who is always in for a good laugh, couldn't laugh about it. Instead he forced me into the store-room at the back of his shop and he showed me a small brown parcel. “Open it!” he said, agitatedly. Surprised, I responded to his request. Slowly I unwrapped the parcel and looked at its contents. At that moment, my heart stood still and now I write these words I start shaking from excitement again. This afternoon I held the package in my unsteady hands, muttering: “How could this happen, how is this possible……”, and now it is lying before me, a book of 120 pages called: BRÜSEL. Indeed, the book that I thought must exists after reading “The road to Armilia” actually existed . When I came home this afternoon I read the book thoroughly and found some conclusions I had drawn after studying “De Archivist” and “The road to Armilia” confirmed. Brüsel is a city driven by ambition, torn down completely to be rebuilt afterwards, like a phoenix risen from its ashes. Out of an ordinary provincial town, Brüsel is transformed into a first class metropolis by property developer Freddy de Vrouw. Its centre is the classical Palace of the Three Powers, designed by architect Theodore Poelaert. 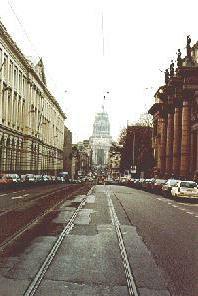 Striking are, I think, the apparent resemblances that show in the album between Brüsel and the major city of Belgium Brussels. Not only do the names look alike, but there are also obvious resemblances to be found between the Palace of Three Powers in Brüsel and the Palace of Justice in Brussels. I will investigate this more thoroughly. After a closer study of Brüsel I came across some other things as well. At first I discovered that Theodore Poelaert the Palace designed of Three Powers in Brüsel and that someone called Joseph Poelaert designed the Palace of Justice in Brussels. The names are just too much alike…. Secondly, I discovered that there is a tram with number 81 in Brüsel as well as in Brussels, and they both have destinations Bockstael and Montgomery. I think that I can conclude from these discoveries, that the two cities are parallels. And it wouldn't surprise me if there is a link somewhere in Brussels. Maybe in the Palace of Justice. Despite the fact that I finally found something that was completely about the city of Brüsel, it didn't even begin to lessen my curiousity, let alone to satisfy it. On the contrary, my curiousity has increased. I have got the feeling that I am close to the solution of the mystery. I will leave as soon as I can find the time to go to Brussels for a few days to see if I can find some clues about Brüsel. Tomorrow is the big day! I am leaving for Brussels to do some investigations about possible connections between Brussels and Brüsel, the obscure city. I am very excited about this and expect a lot of this visit. Maybe too much…. At the moment of writing I have just arrived in my hotel in Brussels. The journey was pleasant and I arrived at the Northern station around half past one in the afternoon. When I left the station,I saw in front of me an empty plain, about 100 meters wide, situated in the middle of town, and behind it were several impressive high office blocks. Involuntarily I had to think about the skyscrapers in Brüsel. Another link between the two cities? I haven't seen the palace of Justice yet. My hotel is in the neighborhood of the Northern station, while the Palace of Justice is supposed to be in the vicinity of the Southern station. I will head that way tomorrow. Right now it is already late, so I will go to bed. The area surrounding the Northern station, by the way, is festively illuminated at night. Quite cozy, all those red lights. This morning I left in good spirits in the direction of the Palace of Justice, hoping to find some answers to questions that have been on my mind for a long time. This time I used the metro. Despite the fact that the building is an imposing work of construction, the visit was a disappointment. In the Palace, that was only partly accessible to the public, I couldn't find a trace that might point to a connection with Brüsel. Suddenly I wondered why I came to this city. Rather down due to this disappointment I decided to explore the area surrounding the Palace. I came to a district situated at the bottom of the hill on which the Palace of Justice was built, where I ended up in a flea-market. As I had no further plans I started strolling across this market, browsing every now and then through the things for sale. While I was searching through a pile of magazines my eyes suddenly fell on a bundle of papers titled: “The Echo of Cities”. Never in my life had I heard of this title and therefore I started reading through this bundle. What a surprise and shock came over me when I saw that the magazines quite frequently spoke of cities as Alaxis, Mylos, Xhystos, Porrentruy and…. Brüsel! Once again fate had given me a document with which I would be able to come another step closer to the solution. I asked the salesman where he got the bundle, but he couldn't help me any further. The man probably didn't know what he was offering, because he sold it for a ridiculously low price. Now back in the hotel I am busy studying “The Echo of Cities”. Except for the Palace of Justice, I didn't see much of Brussels. The last days I have spent only studying the “Echo of Cities” and I only leave my hotel to eat. The “Echo of Cities” contains a vast amount of valuable information about the Obscure Cities; too much too discuss right now, but there are some striking matters. One of them is that one of the articles speaks about the well known author Jules Verne, a person from our world. I suspect that the famous novelist visited the Continent of the Obscure Cities to find inspiration for his novels. A second thing does not consider a person, but a subject. The magazine writes about the landing of a strange sort of plane, which without a doubt looks like a Spitfire in the picture, a means of transport from our world. The article tells about two occupants who, “probably are natives of another world”, according to the “Echo of Cities”. These cases have convinced me of the existence of a connection. Also in the bundle was an article that intrigued me especially: The story about the discovery of hundreds of globes in a gap in the desert of the plateau of Marahuaca. I judge from this as a while that is conserns an entrance. Maybe one of the connections between our world and the Continent of the Obscure Cities? This morning I left Brussels and after a long trip I am home again. While I was in the train I took out my bundle of the “Echo of Cities” and started reading again. Then I read something that I had overlooked during the first time of reading the papers. Somewhere in an article the name of Robert Louis Marie de la Barque is mentioned, a name that can also be found in The Archivist. Despite the fact that my investigations to find out wether this person is known in our world were all in vain, I decide to investigate again. This person fascinates me in some unexplainable manner. Although at first I thought that my visit to Brussels was doomed to fail, I am very pleased about the final results. I know that there is still a lot of investigating to do. I didn't get any information about the connection Brussels-Brüsel, so I have decided to place an advertisement in the newspaper, trying to get possible contacts with people who might know more. I just cannot imagine me being the only one knowing about this mystery. I will have to keep the advertisement inconspicuous, for the prohibition by The Authorities of possessing The Archivist is still fresh in my memory. 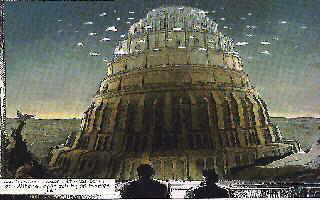 I can imagine that the possession of the “Echo of Cities” will not please The Authorities, if they know about it. Caution is a necessity. I have heard that an explorer, named Wilbur Lequebe, was arrested by the Authorities. He was arrested, because The Authorities say that he tried to broadcast a documentary that is considered subversive. An interesting detail about all this is that I have heard that the film is about a parallel world and about possible connections with that world. It ia a fact though that the film called: “Le dossier B” is prohibited and all copies of it are destroyed. Therefore, it is a situation similar to the affair involving “The Archivist”, of which I managed to get hold of acopy. My hope is that the same will happen with Le Dossier B. This would be quite pleasant, as my investigation went to a dead end again. The advertisement I put in the paper didn't have any success at all. I studied the Echo of Cities closely and my only conclusion is that there have to be connections with the world of the Obscure Cities. Knowing where they are is my next step; maybe somewhere in Brussels? The mystery is solved!!!! I received a parcel by mail today that came from the paper in which I put my advertisement. I must say that I didn't expect to get any response at all anymore, so this was a pleasant surprise. The parcel contained a videotape and an anonymous letter. I was shocked: the contents of this tape was the forbidden film Le dossier B by Wilbur Lequebe. I had to take a short break before I was able to write down the contents of this hallucinatory film. I will write down as clearly and concisely as possible what this film is about. The film is about a female journalist, Claire Devillers, who starts an investigation about the Underground of Brussels. 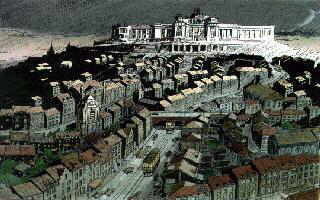 In the course of this investigation she encounters a painter who has created a map of the passages under the Palace of Justice. The name of this artist gave me a hard time breathing for a while: Robert Louis Marie de la Barque! 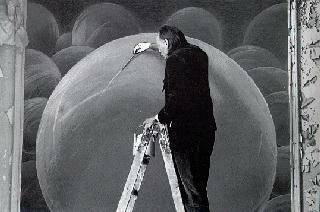 He appears to be a painter from Brussels who lived in the beginning of this century. 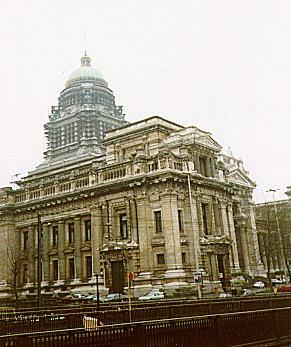 His fascination for the Palace of Justice proceeded from his belief that an entrance had to exist to a parallel world, situated in the Palace of Justice. The entrance to Brüsel? A second person that was introduced in the film had written a book about the connection-theory: Pierre Lidiaux. The book is supposed to contain some interesting information, but Devillers is unable to get a hold of the book at the start of her investigation, not even when she goes to Henri Vandebelle, employee of the city-archives of Brussels. The fact that the book was not in the collection (the publisher went broke and the author has disappeared) didn't mean a great disappointment as Vandebelle was able to give some other information about Lidiaux. Among other things, there was a film that Lidiaux made in the sixties about Antoine Wiertz, a Belgian painter who lived at the end of the last century. Lidiaux makes it seem like Wiertz was also someone who believed in the connection-theory and that he even might have found the connection. 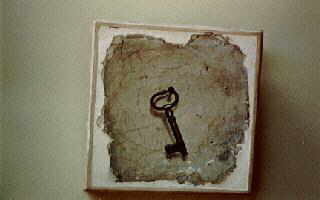 This theory is supported by the painting “Of the key and the opened door” by Wiertz in the museum with the same name, a metaphor for the connection with Brüsel. and the already mentioned Wiertz. Modern followers are supposed to be former mayor and Prime-Minister Paul van den Boeynants and the developer Charly de Pauw. Both of them are responsible for the demolition of the Northern district and the construction of some disgusting skyscrapers. This is where the dream stops for the former members of the sect, who mainly wanted a beautiful Brussels, and now it makes place for the chase for profit. During the investigations of female journalist Claire Devillers, Henri Vandebelle, the keeper of the archives, disappears as well. She his, however able to get into his apartment and discovers, besides a few beautiful paintings by de la Barque, a copy of Le Dossier B. The book proves not to be of scientific value, but a novel, which answers the question of where Brüsel is situated. Maybe in the future the continuing search for Brüsel in the centre of Brussels will not be necessary anymore. 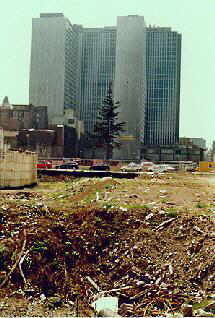 By then it will be useless to destroy Brussels to look for traces of Brüsel, as the two cities will have become one. They will look so much alike that you won't be able to tell one from the other. At the end of her inquiry, Devillers gets a videomessage of the lost Vandebelle. He states that he has found the passage in the book of Lidiaux and that he is going to Brüsel. “Another one in a long queue” is what I thought when I heard Henri Vandebelle mention that he was going to Brüsel. There are quite a few people who found a passage, according to the things I studied last few years. Jules Verne is mentioned in the Echo of Cities. Also mentioned are the Spitfire and its occupants. De la Barque must have been there, judging from his paintings and the fact that he is mentioned in the Archivist and the Echo of Cities as an inhabitant of the cities Calvani and Urbicande. In the film it is said that it is to be suspected that Antoine Wiertz and Van den Boeynants have been to the Obscure Cities, but no real evidence is given. Of Pierre Lidiaux it can also be said that he must have been to the Obscure Cities, and he is probably still there, judging from his mysterious disappearance a couple of decades ago. The last one in this queue is therefore Henri Vandebelle, who says himself that he has found the passage and will use it. This only makes me desire to be one of them. On January 3, 1900 did a painter, named Augistin Desombres, reach the world of the Obscure Cities through an entrance on the plateau of Aubrac. How I know all this? 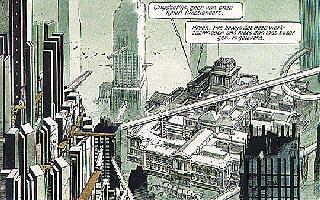 Easy, the latest publication of the authors Schuiten and Peeters, titled: The Leaning Child, showed this. I wasn't even surprised by this new publication. After seeing “Le Dossier B” I already expected more information about the Obscure Cities. So now we have the leaning child, the history of Mary van Rathen, daughter of an industrialist who was attracted by some weird cosmic force of another world that makes her lean in her own world. This happened because of an interruption in the cosmic balance which causes an entrance to the world of the Obscure Cities to open. 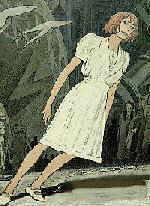 Mary tries, accompanied by scientist Axel Wappendorf, to find the cause of her “leaning” and ends up in a subterranean space where the find a collection of globes, of which only one attracts Mary. That is where she meets the painter Augistin Desombres who is the cause of the disruption and also the one who establishes the cosmic balance, which allows Mary to lead a normal life.